Living up to the name, the Bell Bullitt is made with a low-profile carbon composite shell and features a multi-density EPS liner. Though it may look vintage, the Bell Bullitt Helmet comes with some modern amenities, including integrated speaker pockets for your media needs. To capture the essence of the retro-styled frame, Bell has announced the Bullitt Carbon Chemical Candy and Bullitt Chemical Candy graphics for 2017. 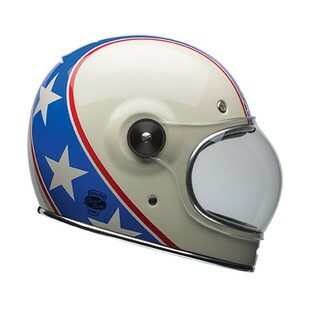 The Bell Bullitt Carbon Chemical Candy Helmet bears resemblance to the Custom 500 Chemical Candy in regards to the colorway and pattern. 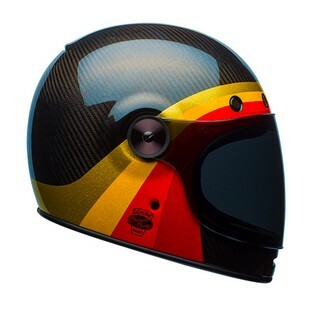 The red, yellow, and gold stripes outlining the face of the helmet give the helmet the vintage look that it is attempting to achieve, but it’s the carbon fiber that brings the Bullitt Carbon Chemical Candy Helmet into the 21st Century. As far as looks go, Bell effortlessly blends modern and retro styles with the Bullitt Carbon Chemical Candy Helmet. On the other hand, the Bell Bullitt Chemical Candy Helmet abandons any attempts to look modern by fully embracing the styles of the past. Taking influence from the style of Evel Knievel’s trademark jumpsuit, the Bullitt Chemical Candy is as bold as the man it bites its style from. The Bullitt Chemical Candy Helmet ventilation system includes 5 metal mesh intake vents with 1 rear exhaust vent to keep riders as cool as their helmet.